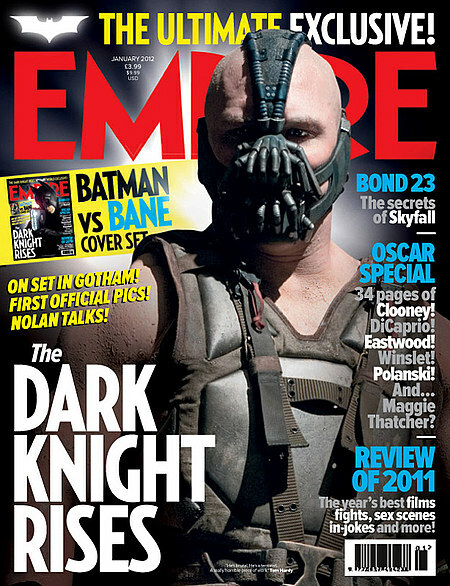 Empire Magazine has a new feature story on The Dark Knight Rises, as well as multiple covers for the issue. 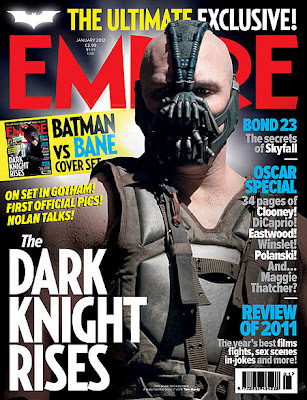 Christopher Nolan speaks for the first time in a while about when The Dark Knight Rises takes place and more! "Our story picks up EIGHT years after The Dark Knight". In terms of finishing our story and increasing its scope, we were trying to craft an epic. It's really all about finishing Batman and Bruce Wayne's story. We left him in a very precarious place. 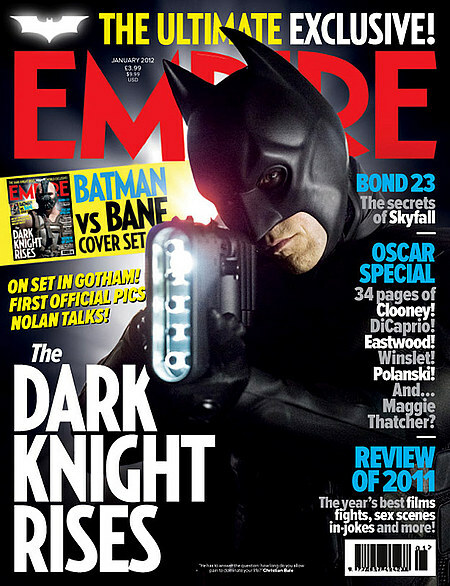 Perhaps surprisingly for some people, our story picks up quite a bit later, eight years after The Dark Knight. So he's an older Bruce Wayne; he's not in a great state. With our choice of villain and with our choice of story we are testing Batman both physically as well as mentally. Also, in terms of finishing the our story and increasing its scope, we were trying to craft epic so the physicality of the film became very important. The Prologue is basically the first six, seven minutes of the film. Its the introduction to Bane and a taste of the rest of the film. With Bane we are looking to give Batman a physical challenge that he hasn't had before. He's a great sort of movie monster, but with an incredible brain, and that was a side of him that hand't been taped before. Because the stories from the comics are very epic and very evocative---very much in the way that Bruce Wayne's origin story is epic and evocative. We were looking to really parallel that with our choice of villain. So he's a worthy adversary. I felt that if I could get somebody as talented as Tom to agree to hide himself in the character I would get something very special. What I really feel with a great actor is every movement, every hand gesture, every step, has performance in it. Tom completely got it. It's an incredible challenge to remove motion of the face so that you can't put things across in the usual way, and you just have the eyes and a bit of the scalp and the arms and legs. What I knew is that from Tom I would get something where you get a total character and everything has incredible thought applied to it. And a lot of what he's doing is very counterintuitive. He has this incredible disjunct between the expressiveness of the voice and the stillness of the movement of his body. He's found a way to play a character who is enormous and powerful with a sort of calm to it, but also is able to incredibly fast at times. Unpredictable. He just has a raw threat to him that's extraordinary. 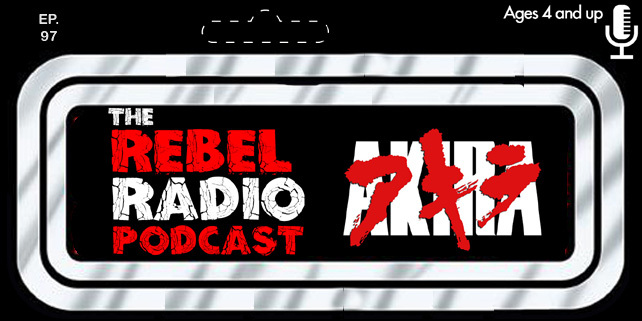 It's a very powerful thing when you see it come together, beyond what I have ever imagined. That's what you get from working with great actors. The world of Batman indeed the world of all graphic novels, deals with archetypes, and there's a very real sense in which the Joker is an extreme and an absolute. So when you're looking to continue the story, then you certainly don't want a watered-down version of a character you've already done. You want a different archetype. What Bane represents in the comics is the ultimate physical enemy." "The world of Batman, indeed the world of all graphic novels, deals with archetypes," he says, "And there's a very real sense in which The Joker is an extreme and an absolute and Batman is an extreme and an absolute. So whe you're looking to continue the story - in this case finish Bruce Wayne and Batman's story, as we see it - then you certainly don't want a watered-down version of a character you've already done. You want a different archetype. 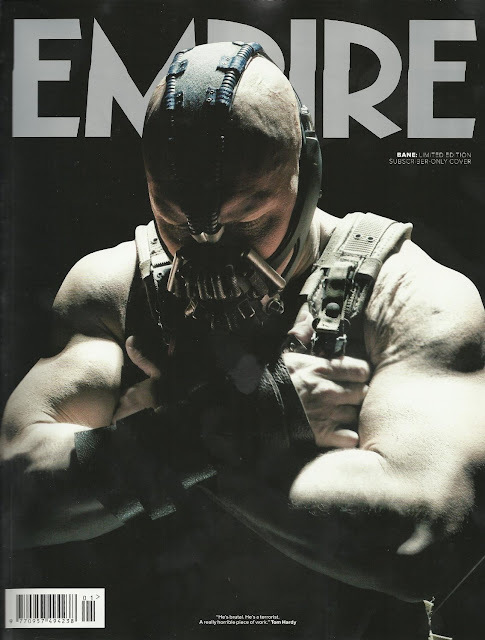 What Bane represents in the comics is the ultimate physical villain." "It's really all about finishing Batman's and Bruce Wayne's story. We left him in a very precarious place at the end of The Dark Knight. His reputation in tatters, on the run. And I think perhaps surprisingly for some people, out story picks up quite a bit later. He's not in great state. He's frozen in time, he's hit a brick wall. Batman Begins was very much about the explaining the logic of the suit, and how it belonged in the shadows, in a position of stealth where he's able to intimidate people with it as his new entity. And then through The Dark Knight we would him out during the magic hour and we changed the suit accordingly so he withstood that kind of exposure. But also the character himself has the reputation now, so he;s able to expose himself more and still intimidate people. And with the third film we're pushing that further...but plenty of it takes place in the dark too."